This may be some sort of record for me: two days of driving and I'm still in the same state. And it's not even a big one. Slept a little late this morning, so the drive didn't begin until after 9:00; then zipped up the last 65 or so miles of Route 1 to Fort Kent, Maine, the end of the road. 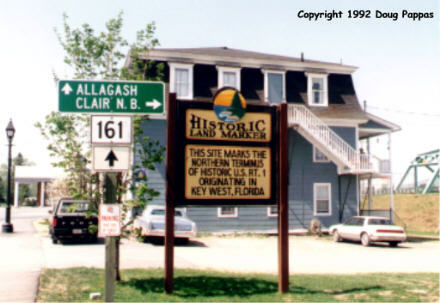 For some reason, both the Key West and Fort Kent signs proclaim that 1 "begins" in Florida and "ends" in Maine, even though for most of its life, the traffic has flowed the other way. Northern Maine is Acadian country: all the big churches are Catholic, and half the names are French. A non-ethnic Down East phenomenon is the penchant for suspending mailboxes from arms overhanging the roadside instead of mounting them on piles. This prevents the snowplows from knocking them down twice a week from November through March. To solve the problem a different way, one ingenious homeowner mounted his mailbox on a heavy spring..
Route 1 ends just east of the bridge to Canada, though a state route continues west for another 25 miles to Allagash before finally running out of roadbed. I heaved a deep sigh at finally completing the first of six pairs of roads, then turned the car around to begin another pair. Route 2 begins at the Canadian border in Houlton. Both it and I-95 emerge from the same customs station, then roughly parallel one another for 200 miles. The first forty miles of 2 really aren't worth the bother, except for looking around Houlton -- the road's been beat to hell by frost heaves. Then it gets more interesting, skipping from river to river across central Maine (central by geography, though the northernmost outpost of settlement through most of the state). After photographing a 31' Paul Bunyan in Bangor, I found the World's Largest Indian Statue behind the Bowl-O-Drome in Skowhegan. This 62' high pine sculpture was intended as serious art, "dedicated to the Maine Indians, the first people to use these lands in peaceful ways," but it's hard to take seriously. Serious civic sculptures don't hide behind commercial parking lots. Serious civic sculptures don't give their noble honoree the proportions of a Somalian refugee. 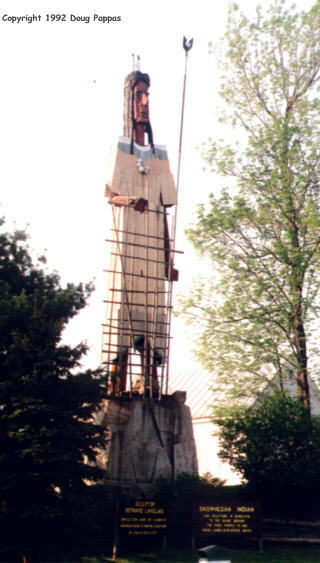 And "historical accuracy" or no, serious civic sculptures don't depict their subject holding a wooden fish trap which gives the effect of permanent scaffolding across the bottom half of the figure.